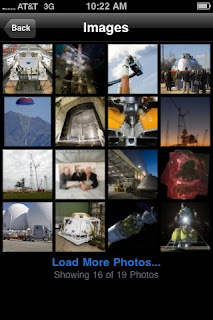 The Launch Pad: Friday Fun Day #FFD - Space Exploration: There's an App for That. 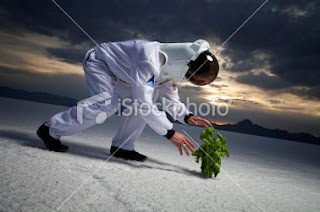 Friday Fun Day #FFD - Space Exploration: There's an App for That. I had a funny space photo caption post for you guys this week, but I have to admit that I've been quite distracted by the new NASA iPhone/iTouch app this morning. 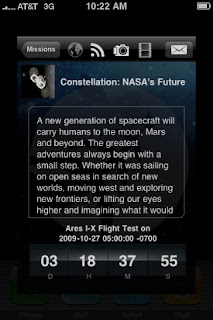 Info about the new app on the NASA website is here, and the download link is here. I clicked Constellation. A program overview appears, and a countdown clock to the Ares I-X launch is at the bottom. That's pretty cool. 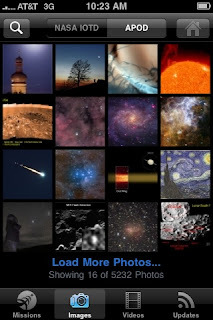 Back on the homescreen of the app, you can also view the NASA Image of the Day and Astronomy Image of the Day, NASA YouTube videos, or NASA Twitter feeds. 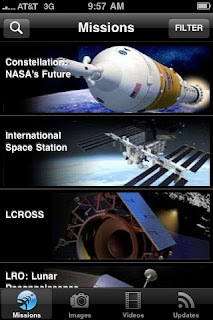 Regarding future development on other platforms, NASA Ames tweeted this morning: "NASA is committed to developing additional apps for a range of mobile devices to better disseminate NASA’s knowledge, activities and results".